About 110 LC students are studying abroad this summer in programs exploring China, Costa Rica, Great Britain, Québec, St. Lucia, Uganda, and beyond. China: The Business World of a Rising Economy, led by Dr. Dan Messerschmidt, will explore an emerging economy firsthand with visits to dynamic corporations and manufacturing facilities in Beijing and Shanghai and excursions to the Great Wall and rural villages. While in China, LC students will have the opportunity to meet students at Chinese universities, which will enhance the cross-cultural experience. Costa Rica: Spanish Language and Tico Culture, led by Dr. Georg Schwarzmann, focuses on Spanish language skills through experiencing the vibrant culture of Costa Rica. Students will take classes at the Universidad Nacional Autónoma de Costa Rica (UNA) in Heredia and live with host families to maximize their language learning and cultural experience. Excursions will include visits to points of interest in San Jose, national parks, and activities related to eco-tourism. Great Britain – London and Edinburgh: Comparative Criminology, led by Dr. Kim McCabe, offers students a view of the fascinating and sometimes dark criminological history of London and Edinburgh and a glimpse of the British penal system of today. By plunging into a world rife with notorious characters and infamous sites, participants will increase their understanding of the history of criminology, but also the United Kingdom’s general history, literature, and lore. How Wars End – WWI, WWII, and the Cold War: Paris, Prague, Budapest, Berlin, led by Dr. Dan Lang and Dr. David Lipani, includes travel from Paris to Berlin to experience the conflicts of the 20th century firsthand while studying the literature of war and the processes that promote peace. Political science and literature combine to make this a truly unique experience. Students will visit such sites as the Normandy beaches, the Auschwitz concentration camp, WWI battlefields in Belgium, Berlin’s Memorial to the German Resistance, and many other significant historical sites. Québec City: French Language and Culture à la Québecoise, led byDr. Bruce Mayer, offers a “European” experience in one of the oldest cities in North America while studying at LC’s newest sister school. Laval University will host LC students for a language and cultural immersion program, which includes language instruction, a home-stay experience, and cultural activities. 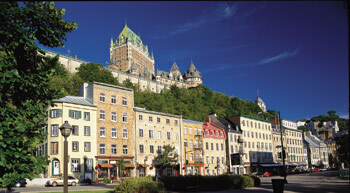 The beautiful city of Québec and its environs on the St. Lawrence River will provide some great sight-seeing. St. Lucia: Island Exploration through Service-Learning, led byKathy Husted,Adam Dean, and Dr. Connie Messerschmidt. Make a difference and interact with the local culture by participating in an international service learning experience. Each activity is targeted to the student’s major program. For example, education students conduct developmental screenings for young children to assess their readiness for school entry. Communication studies students will work on documentary film production. In addition, students will have the opportunity to explore this tropical island as they work jointly with St. Lucians during their service learning projects. Other LC students will study abroad on third party programs sponsored by Semester-at-Sea and IES Abroad (Germany/Balkans).